More songs have been written about Napoleon Bonaparte than about any other military leader in history. Hundreds of songs about Napoleon were written and performed in the 19th century. Napoleon also features as the subject matter of some 20th- and 21st-century songs. If songs that simply mention Napoleon are added to the tally, the number probably reaches into the thousands. Here’s a look at popular songs about Napoleon that have been written in English. The Napoleonic Wars had an enormous influence on cultural life in Great Britain. According to Scottish folk song collector Gavin Greig, “the twenty years that ended with Waterloo have left more traces on our popular minstrelsy than any other period of our history has done.” (1) Popular song was “the most widespread and influential form of literary and musical expression” in Britain at the time, and Napoleon was a common subject matter. Many songs about Napoleon were printed cheaply as texts on broadside ballad sheets. Ballad singers sang on the streets or in pubs in exchange for pennies. Performances were often a cappella, with lyrics and tunes varying from one appearance to another. As in British caricatures of the time, Napoleon was often portrayed in an unflattering manner: “little Boney,” “the Corsican monster,” “the Corsican pest,” etc. During 1803-1805, when Napoleon was threatening to invade Britain, songs formed part of a propaganda campaign aimed at arousing British patriotism and getting more men to enlist in the army and the navy. In later songs, particularly those written after Napoleon’s 1815 defeat and exile to St. Helena, Napoleon is regarded more favourably: “that hero bold,” “brave Napoleon,” “Bonaparte, the Frenchman’s pride.” These songs tend to focus on Napoleon as a man, rather than as an enemy leader. Some songs about Napoleon became truly popular and were passed down through the generations. These were written down by folk song collectors in the late 19th and early 20th centuries. Henry Burstow, a Sussex shoemaker and bell ringer who was born in 1826 and died in 1916, claimed he knew 420 songs, at least seven of which were about Napoleon (Boney’s Farewell to Paris, Boney in St. Helena, Boney’s Lamentation, Bonny Bunch of Roses, Deeds of Napoleon, Dream of Napoleon, The Grand Conversation of Napoleon). Here is a selection of songs about Napoleon written during his lifetime, with a sample of the lyrics. For the full text, click on the song title, which will take you to the relevant broadside sheet in Broadside Ballads Online from the Bodleian Libraries. To listen to the songs, go to Soundcloud, where Oskar Cox Jensen, the author of Napoleon and British Song, 1797-1822 (2015), has posted recordings of several of the songs listed below, as well as other songs about Napoleon. When and O when does this little Boney come? But it’s O in my heart, how I’ll hide him should he come. That is “hide” in the sense of hitting with a stick. Old Spain, and gay regen’rate France. And blow him quite over to France! Where GEORGE has some thousands such-like at command. Hard fate! Alas, that I am both! My heart of grief is full, Sir. By gar, me wish I was at peace! With honest Johnny Bull! Sir. And Providence fights on their side. Short-legged Boney we’ll soon have you now. He never studied anything but evil, O. Although he was but small he’d swagger over all. Led on by his dear friend, old nick the Devil, O.
Till in despair my men did tire. Then Moscow town was set on fire. You can listen to Irish traditional singer Jim MacFarland performing a version of “Boney’s Lamentation” on the Irish Traditional Music Archive. And set all Europe up in arms? Who shower’d upon us discord’s storms? And drove them back from Paris. Huzza for Old England’s brave boys. Tho’ they’ve now transported me to St. Helena’s shore. When Napoleon Buonaparte came on board. 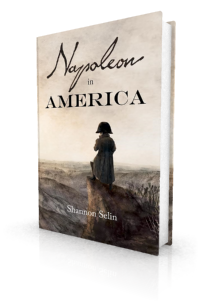 Napoleon died on May 5, 1821, as a prisoner on the remote British island of St. Helena. The following songs were written after his death. Have cause him to die on the Isle of St. Helena. Oh, Boney marched to Moscow, way, hay, yah! Across the Alps through ice an’ snow, Jean François! The song takes the form of a conversation between Napoleon’s son (Napoleon II) and his mother, Napoleon’s second wife Marie Louise. It says Napoleon was defeated because he failed to beware of the “bonny bunch of roses”: the British army and, symbolically, the union of England, Scotland, Ireland and Wales. Will sting the bonny bunch of Roses, O. And in a tomb of marble we will lay him with his son. He caus’d the money for to fly wherever he did go. You can listen to folk singer Andy Turner singing a version of “The Grand Conversation of Napoleon” on A Folk Song A Week. The signal of fame! Cried Napoleon. This song refers to the return of Napoleon’s remains to France in 1840. In every battle manfully, he struggled hard for liberty. And to the world a terror was, Napoleon Bonaparte. And they were in a stew, by Napoleon the Brave. This tune, also known under other “Napoleon Crossing…” titles, may actually have originated as a military march during the Napoleonic Wars (see the Banjo Hangout Discussion Forum). This song, which nearly causes a brawl between General Charles Lallemand and a fiddler in Napoleon in America, originated as a fiddle tune in the 19th century. Hudson Lowe was the governor of St. Helena during Napoleon’s imprisonment on the island. Vic Gammon, “The Grand Conversation: Napoleon and British Popular Balladry,” http://www.mustrad.org.uk/articles/boney.htm. Accessed January 12, 2018. Oskar Cox Jensen, Napoleon and British Song, 1797-1822 (London, 2015), p. 1. 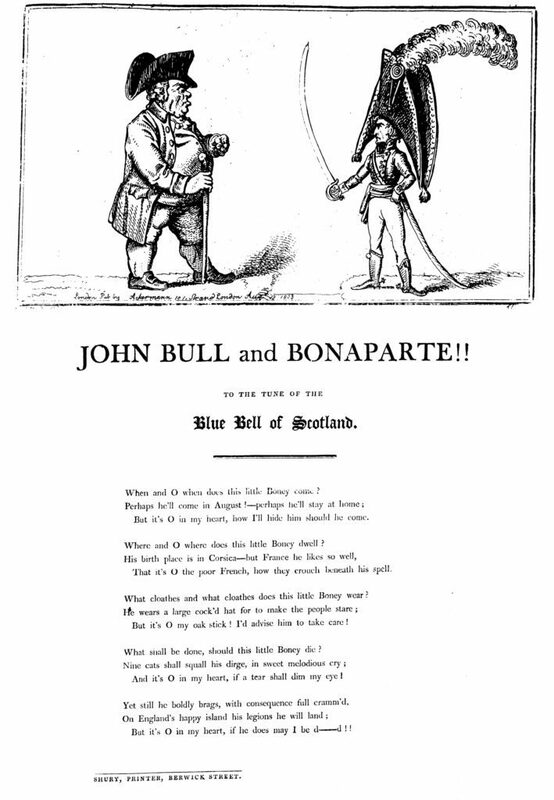 “About The Project,” Broadside Ballads Online from the Bodleian Libraries, http://ballads.bodleian.ox.ac.uk/about. Accessed January 12, 2018. Napoleon and British Song, 1797-1822, p. 133. The Tyne Songster, A Choice Selection of Songs in the Newcastle Dialect (Newcastle, 1840), pp. 33-34. Lucy E. Broadwood, English Traditional Songs and Carols (London, 1908), pp. 34-35, 117. There is a truly horrible song by Robert Schumann called the Two Grenadiers, about two French soldiers who escaped from Russia, only to find that Nap was captive. It incorporates bits of the Marseillaise in all its overblown portentousness. Yet Schumann also wrote songs of surpassing beauty, like Mondnacht, many of which my wife used to sing. Thanks for drawing this Schumann song to my attention, Geoffrey. Maybe I should do a separate post on German songs about Napoleon. James M. Brophy, in Popular Culture and the Public Sphere in the Rhineland, 1800-1850, says folk songs about Napoleon “are pervasive throughout Germany and, generally speaking, are hostile toward Bonaparte” (p. 60). French songs about Napoleon also merit a separate post. For those who are interested, here’s a link to a recording of a performance by Dietrich Fischer-Dieskau and Christopher Eschenbach of Schumann’s “The Two Grenadiers,” with lyrics helpfully posted in English on the screen: https://www.youtube.com/watch?v=uTRnELtTcWY. Thanks for this splendid addition, Lally! I’ll embed the link in the post above. Wonderful, thanks so much Shannon, this is one of my favourites! Having experienced the Longwood Fog myself I can really appreciate poor Napoleon’s lament. I’ll pass on details of your blog to Roger. Keep up the good work! Thanks, Pier. 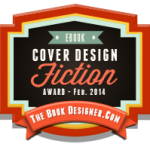 This looks like a fabulous source! Well, shows how deep is the public’s concept of history. I don’t believe there has ever been a song about the Code Napoléon. Likewise impossible a good movie on the anniversary of his death. Interesting the image people have of celebrities after their death: a few faint, memorable touches. But thanks Shannon, I’ll save this link for days on which I want to meditate on human absurdity. I guess N would smile to see, then he’d break out in laugh, slapping Ney on the back. What will people sing about us? Now there’s a challenge for a songwriter – a ditty about the Code Napoléon. Thanks for your comments, Addison. It is interesting to see what touches the public imagination and lives on through popular culture. I’m curious about what evidence you have that the British government actively sponsored a propaganda campaign through song. I know Charles Dibdin suggested harnessing the power of song to rouse national spirits, but was this idea taken up? I’m relying on secondary sources here, Jacqueline, as I have not delved into the primary documents myself. Both Oskar Cox Jensen and Vic Gammon (see footnotes 1 and 2, above) write about the use of songs as propaganda and cite evidence. I’m not sure of the extent to which the campaign was directly orchestrated by members of the government (e.g. Canning with the caricatures). It may be more accurate to call it “loyalist” or “elite” propaganda. Perhaps so. You’ve now piqued my interest, though! If this prompts a visit to the archives, please let me know what you find. I had a neighbour who was a descendant of Napoleon’s prison guard on St Helena. His surname was Bruce. I’m afraid I can’t remember more than that. That’s interesting, Rebecca. Hudson Lowe had three children (two sons and a daughter), all born on St. Helena. I don’t know what happened to their descendants. Or perhaps your neighbour was descended from one of the British soldiers who guarded Longwood House, Napoleon’s residence on the island. Many of them are listed in A St. Helena Who’s Who by Arnold Chaplin (1914): https://archive.org/details/asthelenawhoswho00chapiala. Thanks very much for this, Chris. This is the first I’ve heard of “We Be the King’s Men.” I’ve just looked up The Dynasts, by Thomas Hardy, from which it comes: https://en.wikipedia.org/wiki/The_Dynasts. I’ve now found the complete work on the Internet Archive (Parts I & II here; Part III here). And this brief silent film clip of The Dynasts being acted by the “University Dramatic Society” in 1920: https://www.youtube.com/watch?v=PWfz3Vtiewo. Never were so many melodies, verses and choruses expended in praise, condemnation, pity and ridicule as in the case of Napoleon.